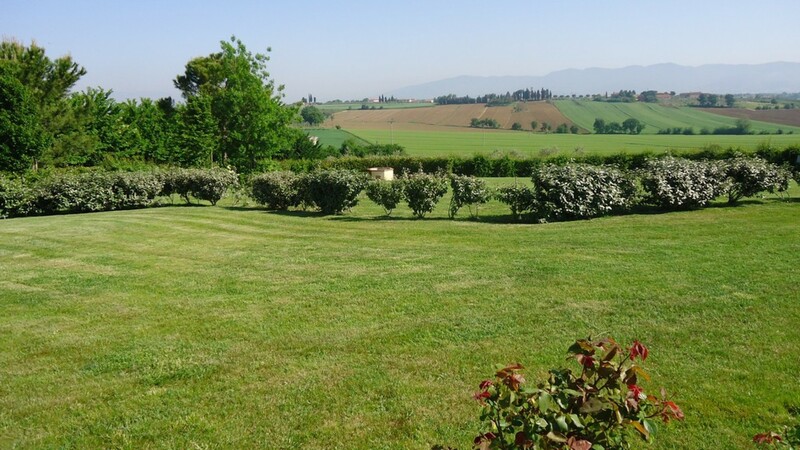 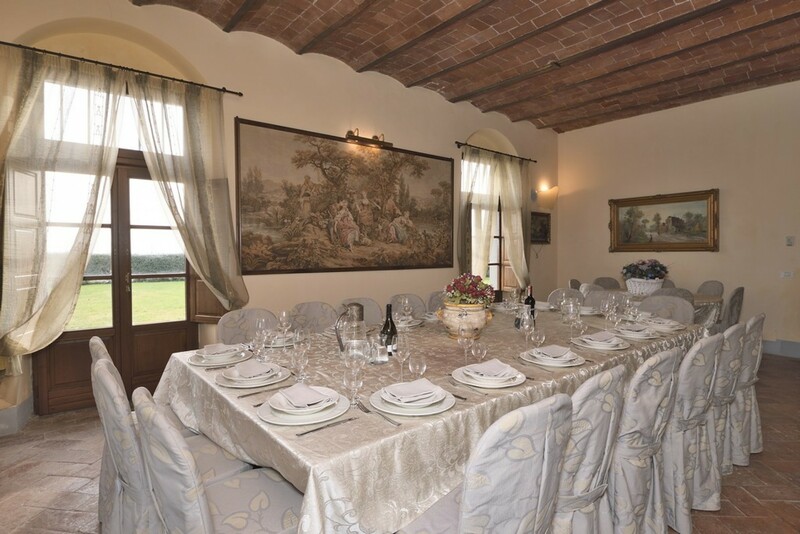 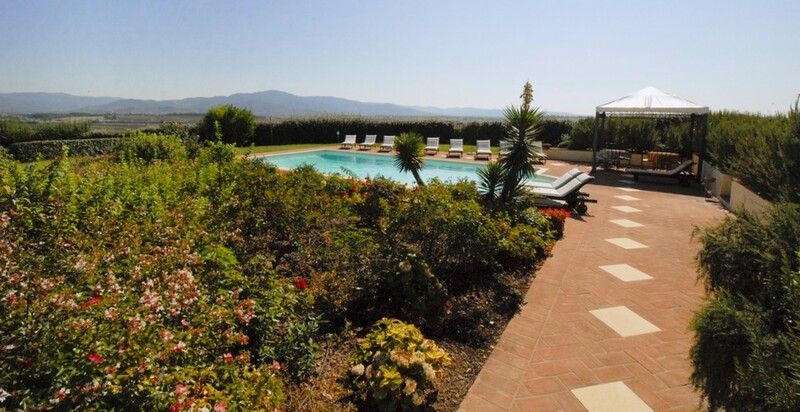 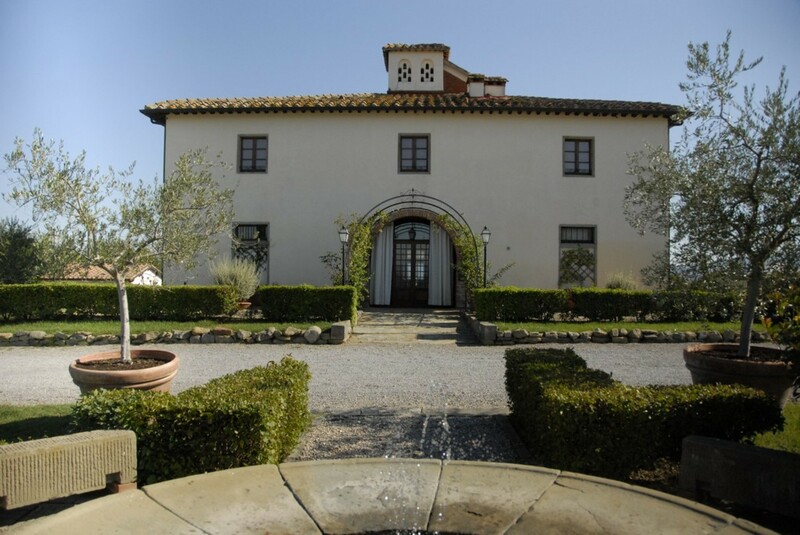 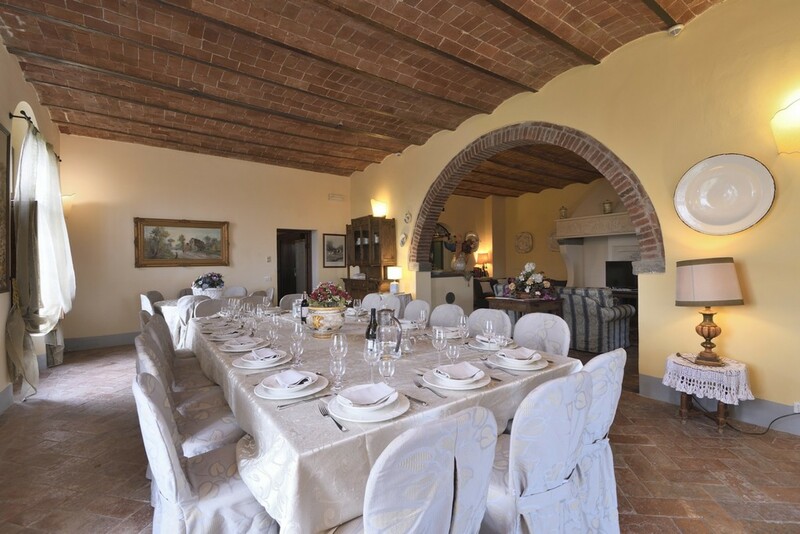 Welcome to Villa de’ Michelangioli, a luxury 9-bedroom villa located in Brolio in the province of Arezzo in beautiful Tuscany. 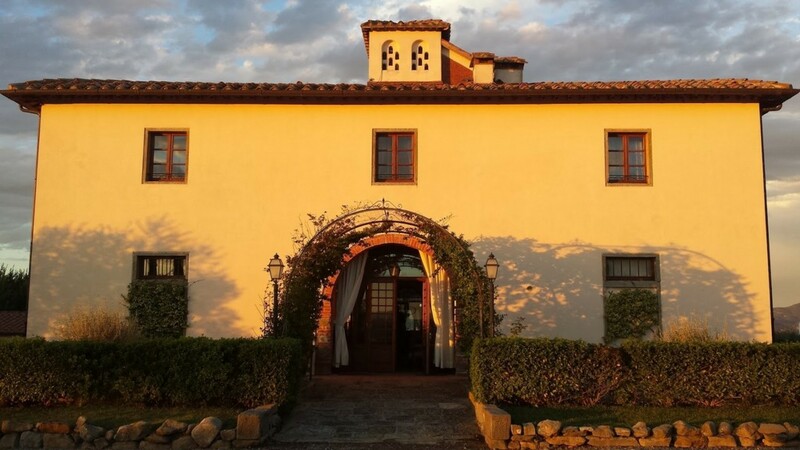 Surrounded by flourishing olive groves, rolling Tuscan hillside and enriched by beautiful gardens, the residence offers the perfect base for a vacation to Italy. 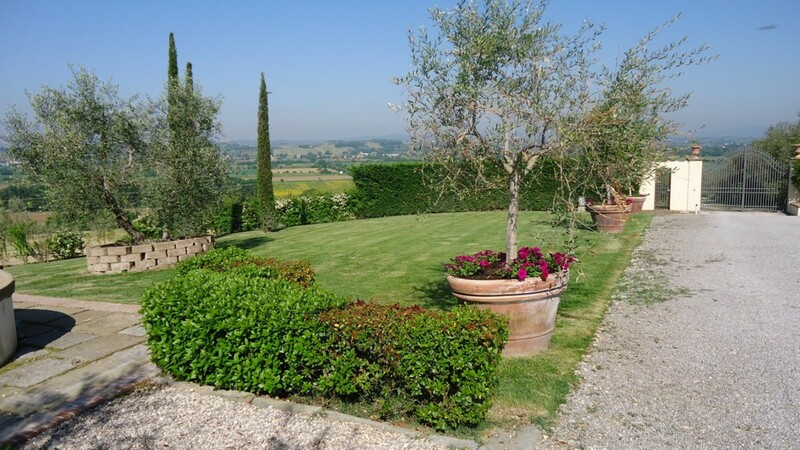 You are located within easy reach of the artistic and historical cities of Florence, Siena, Cortona, Assisi, Montepulciano and Chianti. 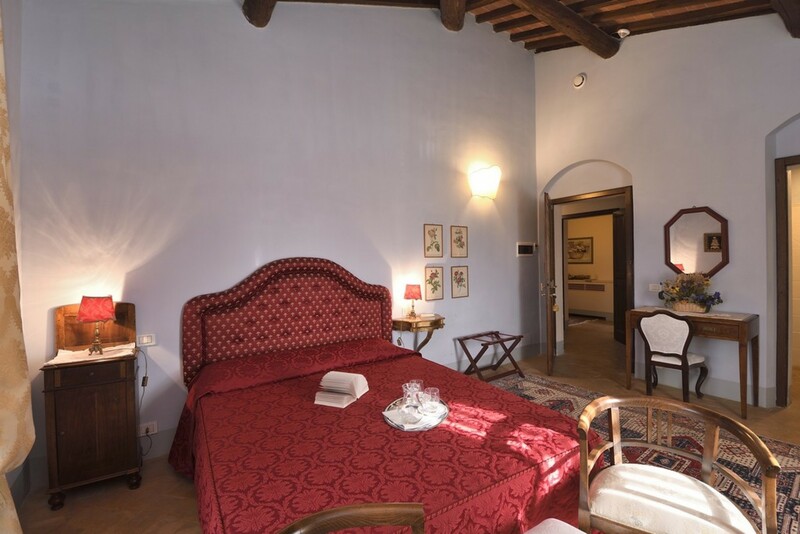 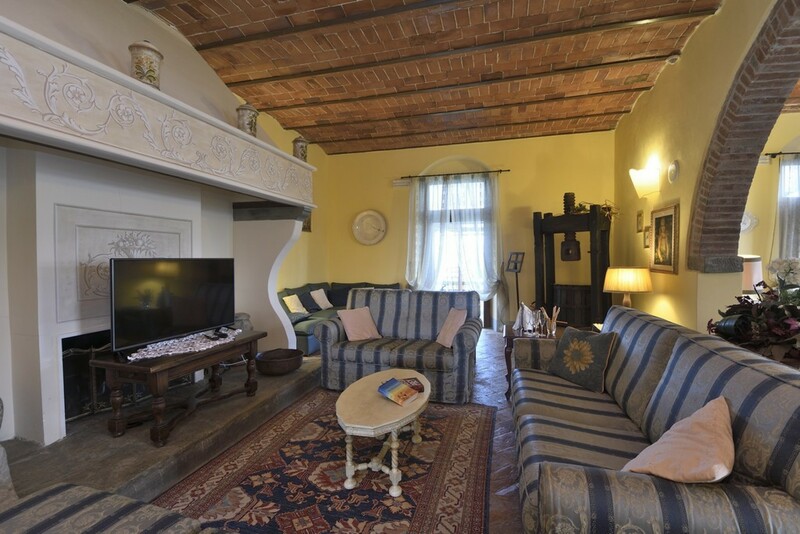 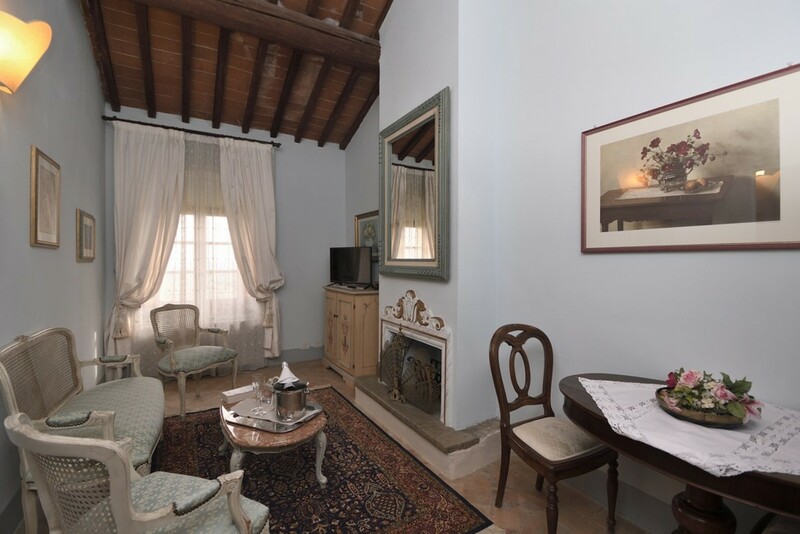 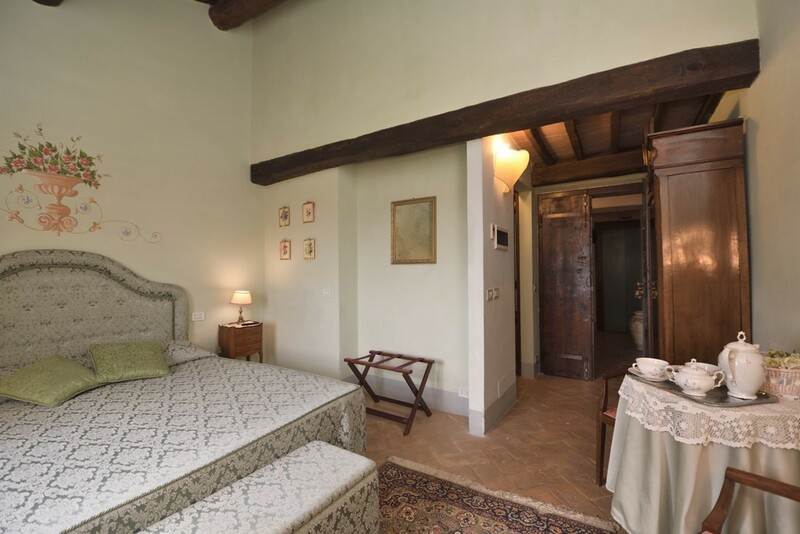 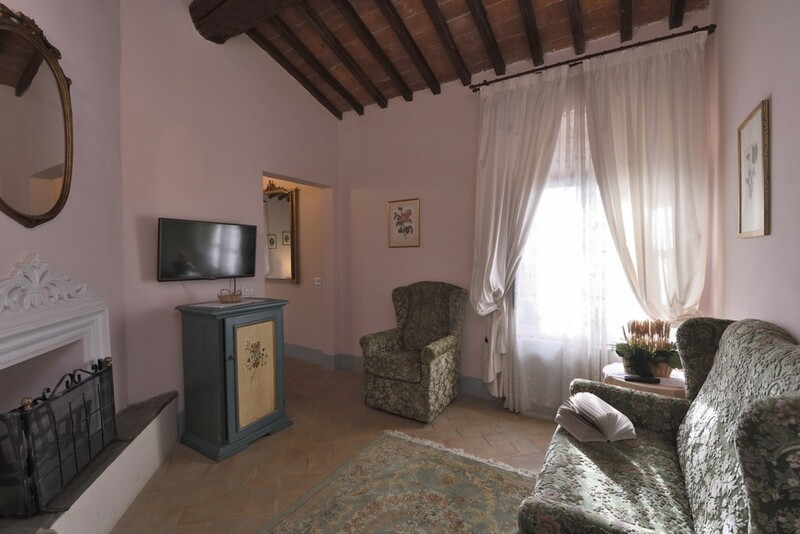 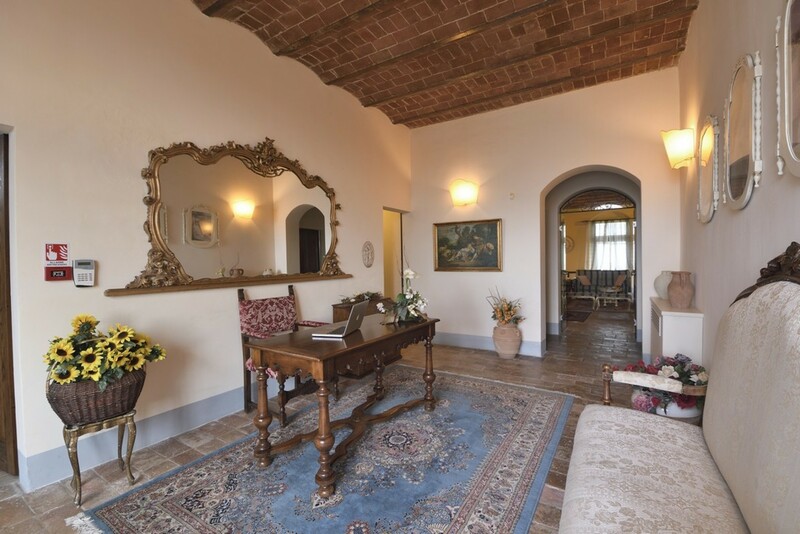 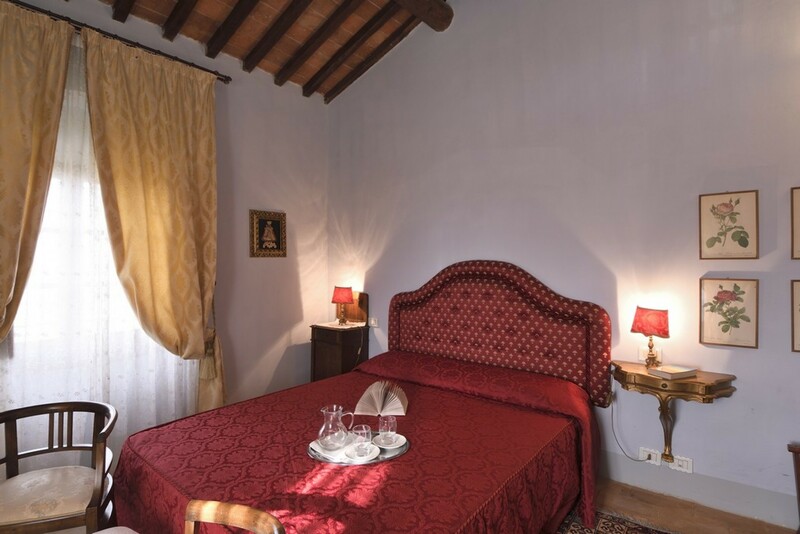 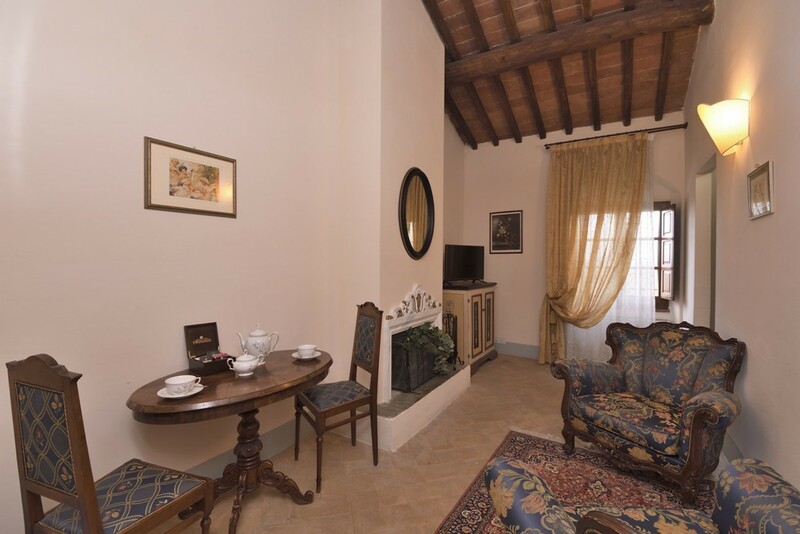 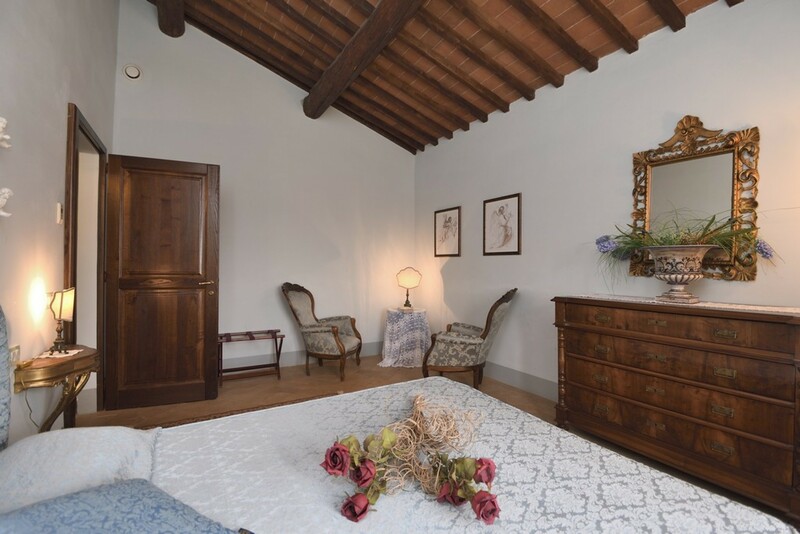 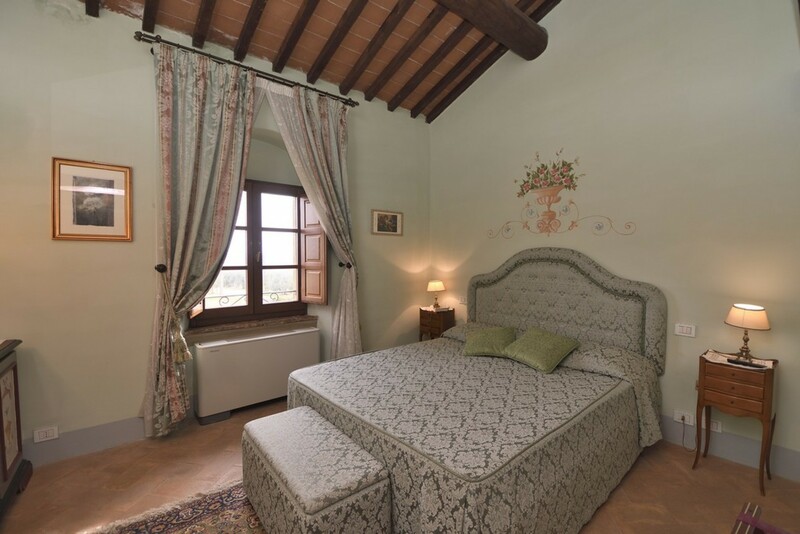 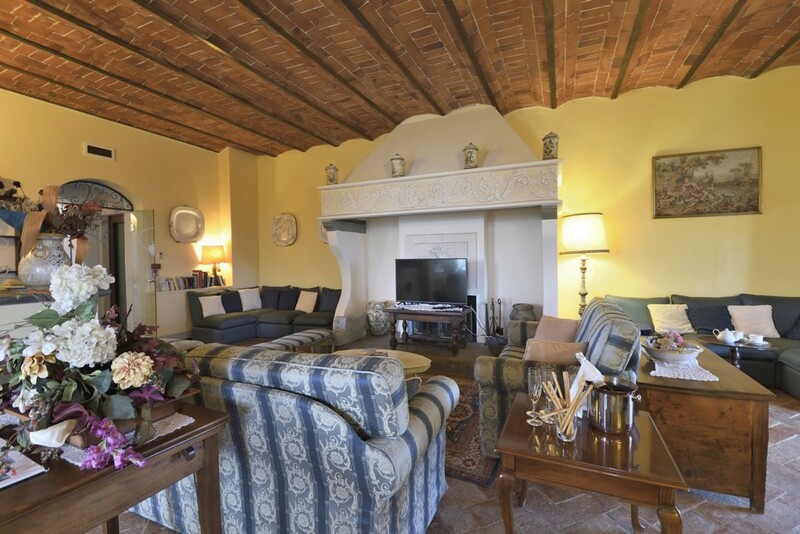 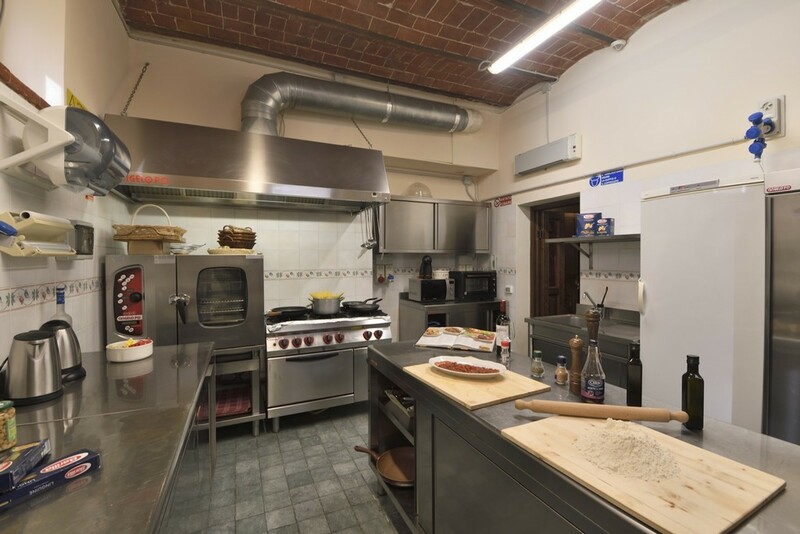 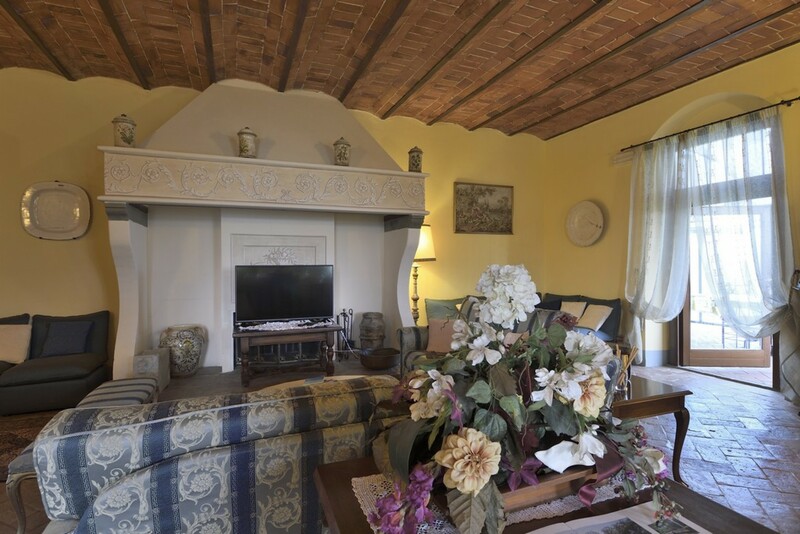 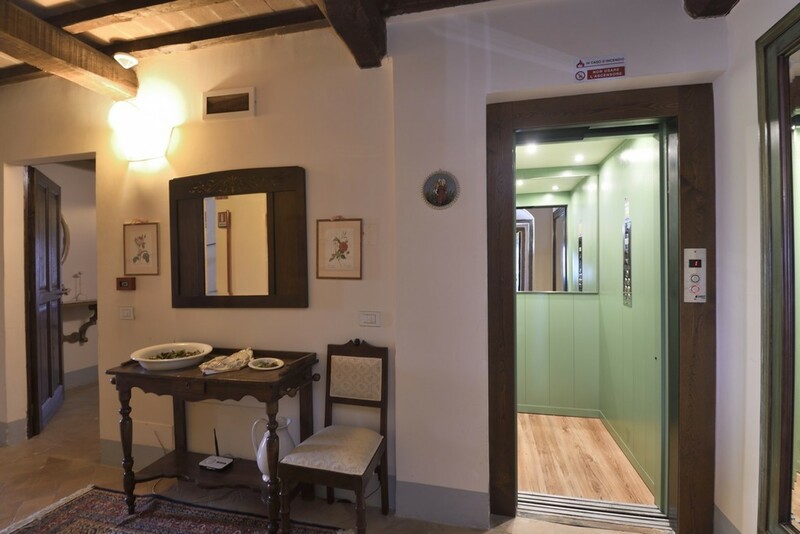 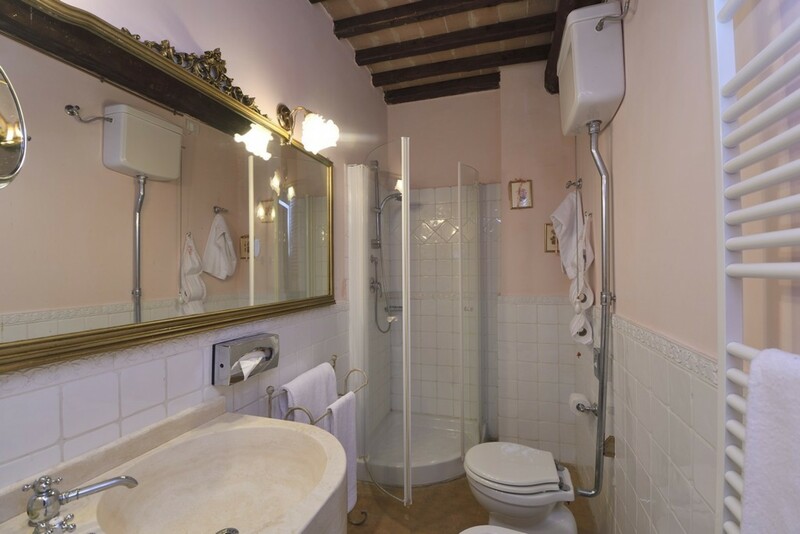 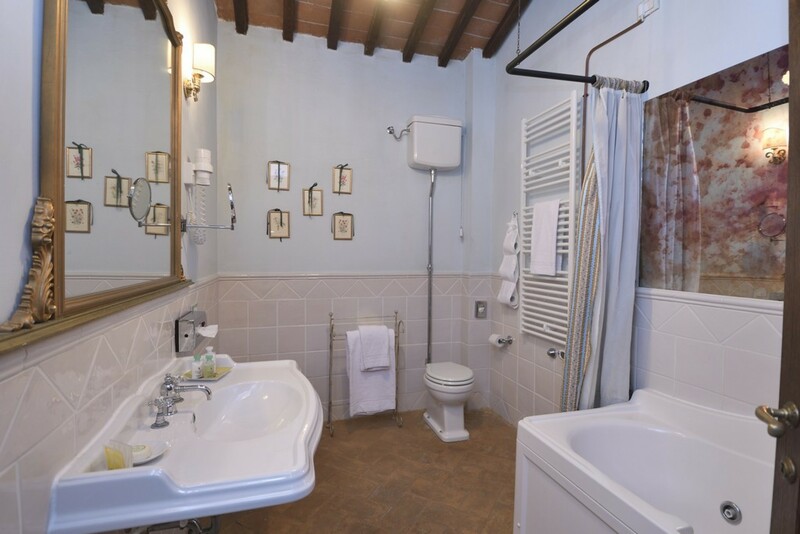 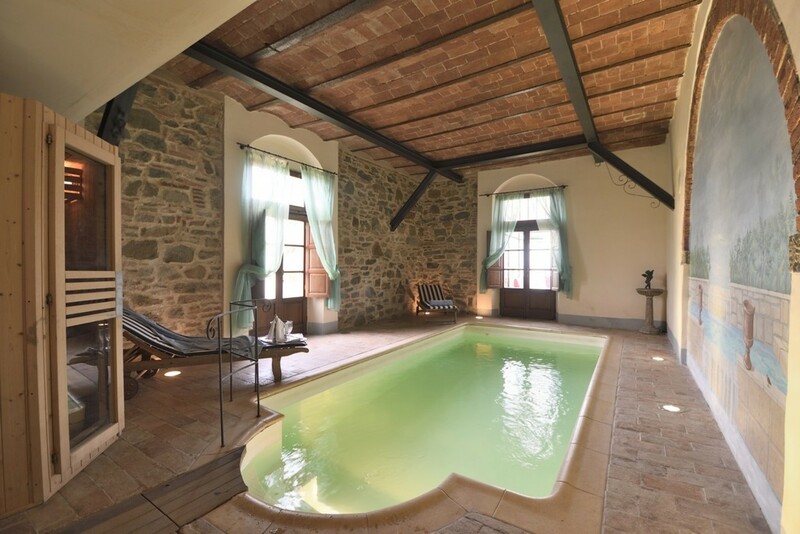 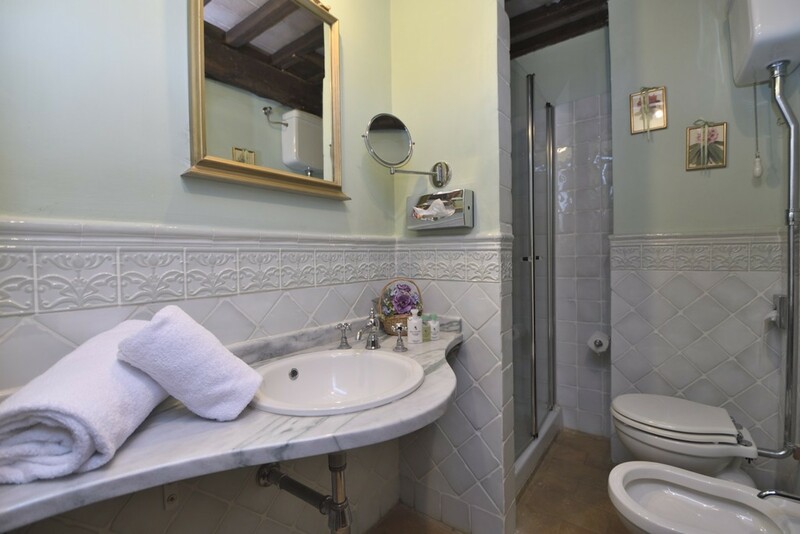 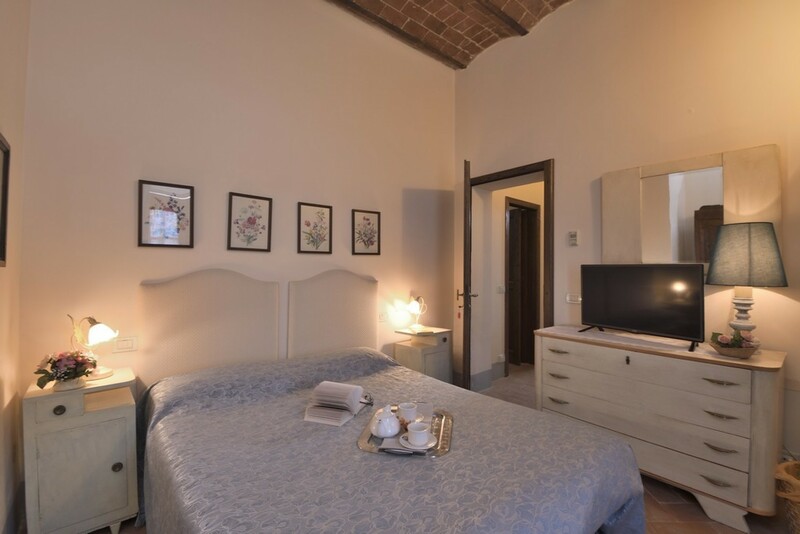 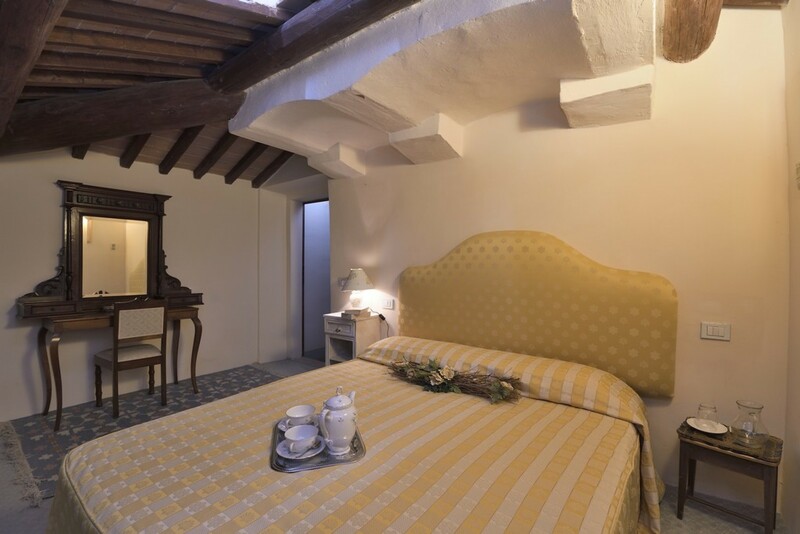 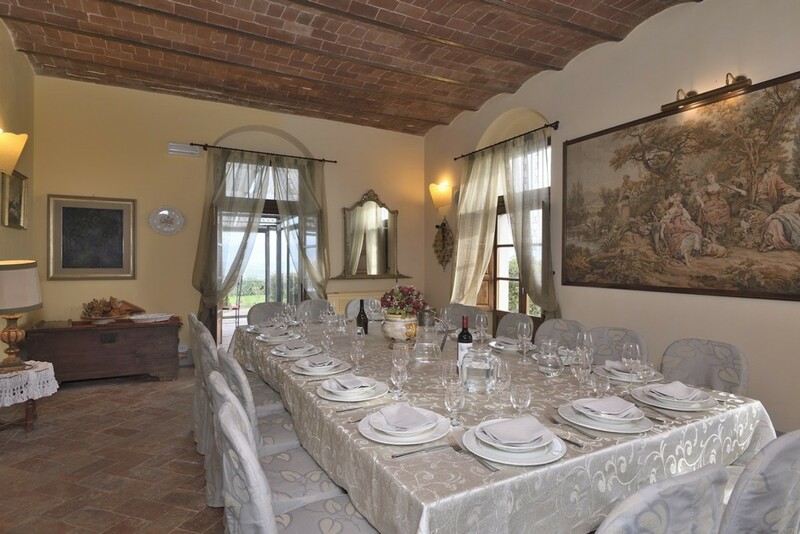 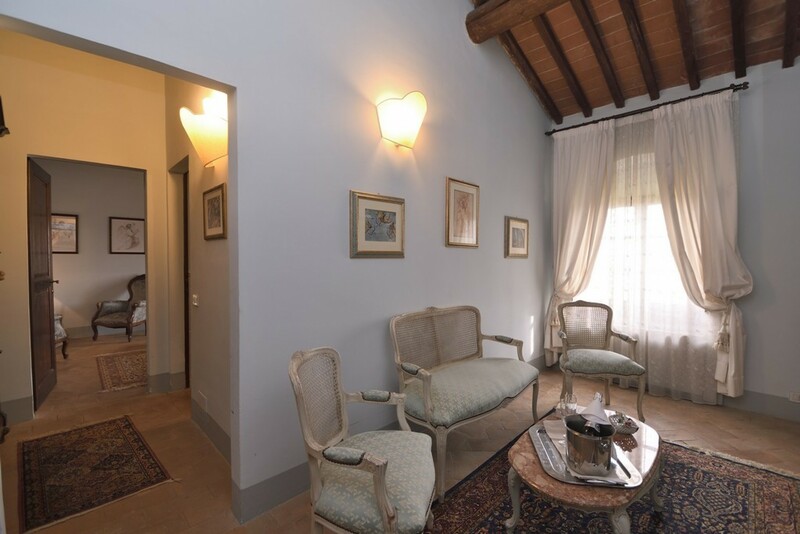 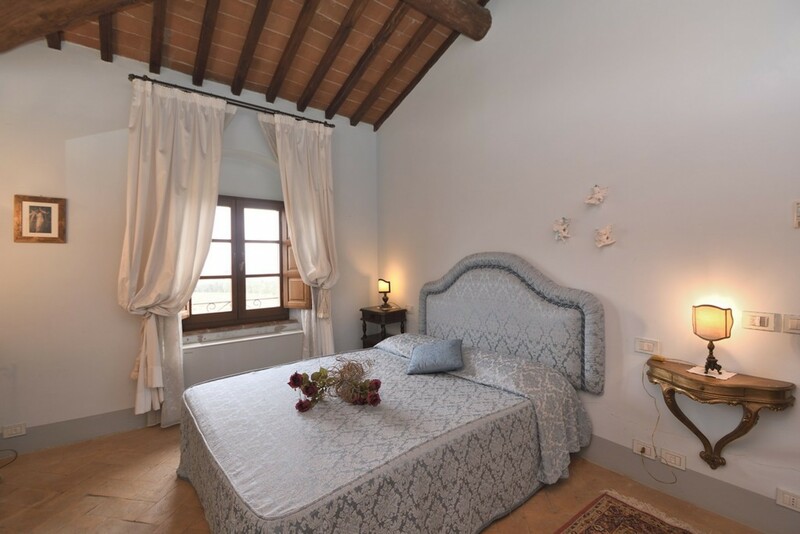 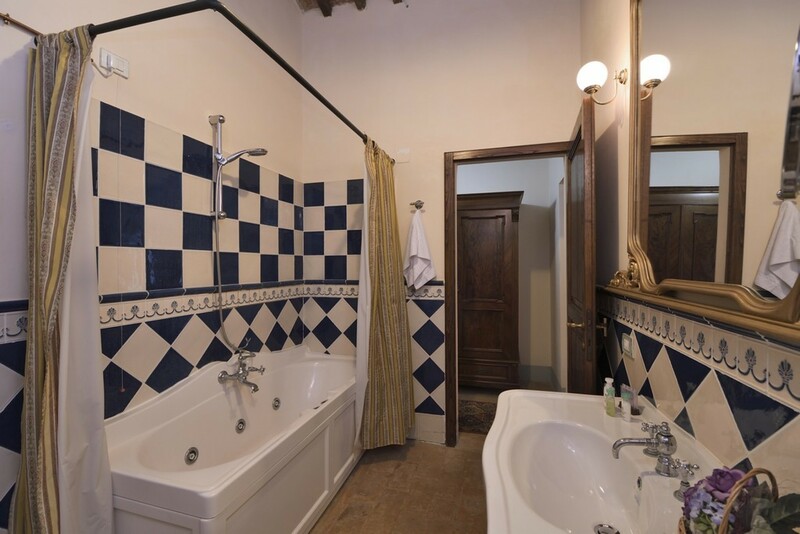 All the original characteristics of the villa have been maintained: the cotto floors, the windows and doors surrounded in stone, wooden beams and brick ceilings have all been restored using the original materials of the villa. 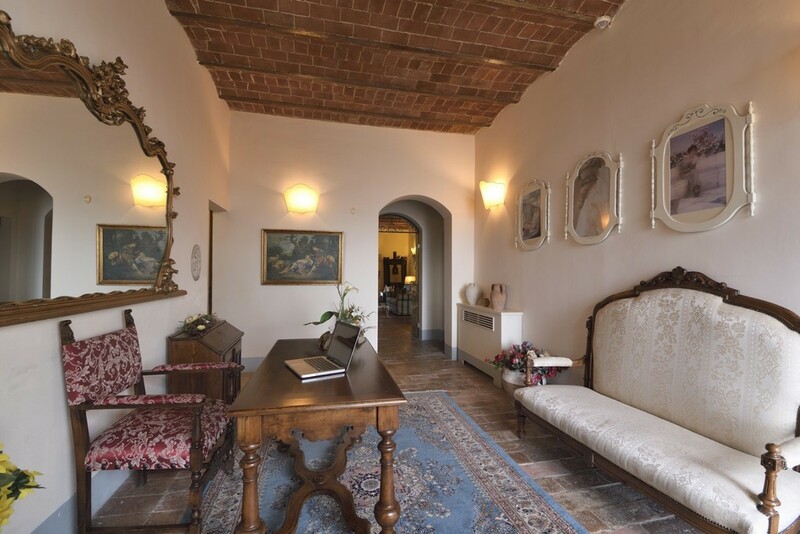 The interior decorating includes antique furniture and precious materials, and the care of details and antique objects enrich the elegant and exclusive atmosphere. 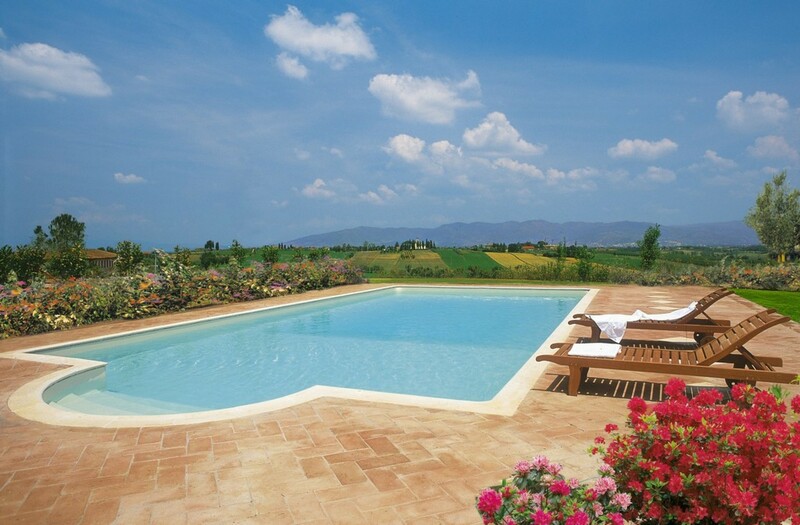 There are two swimming pools. 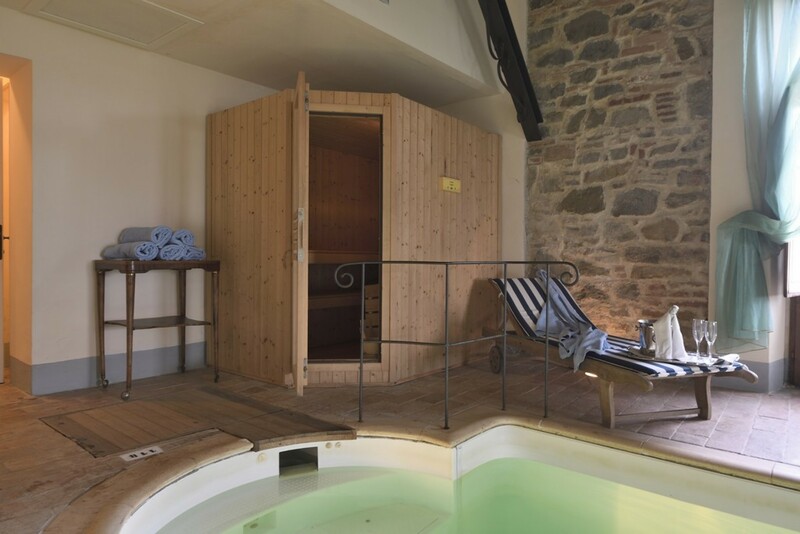 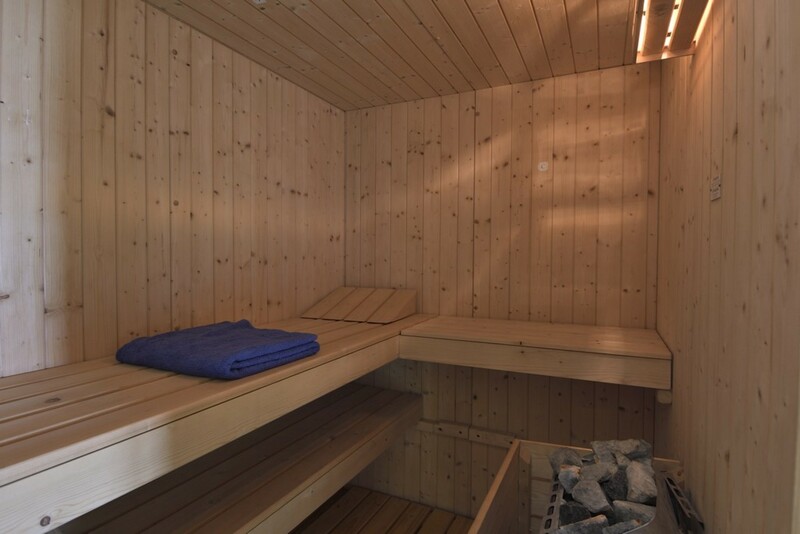 The inside pool is heated and has a hydromassage and sauna. 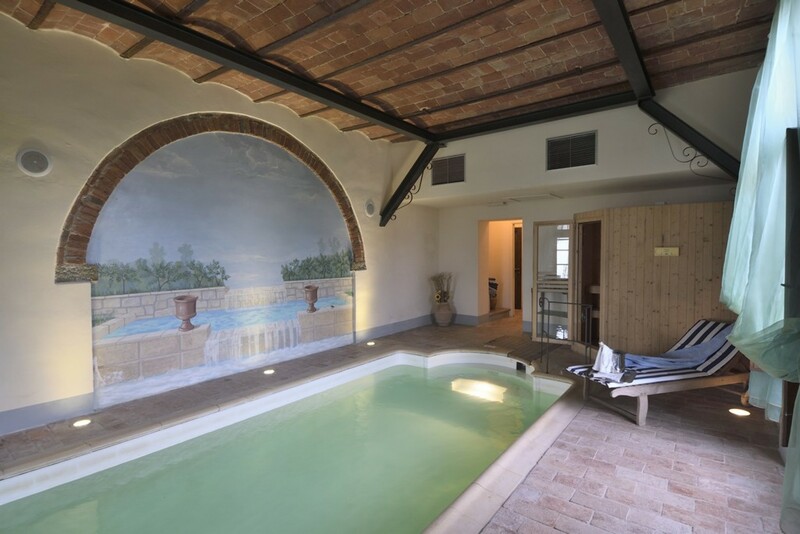 The outside pool (12 x 6 meters and 1.20 - 2.00 meters deep) reached by a Roman stairway, is fenced and surrounded by gardens. 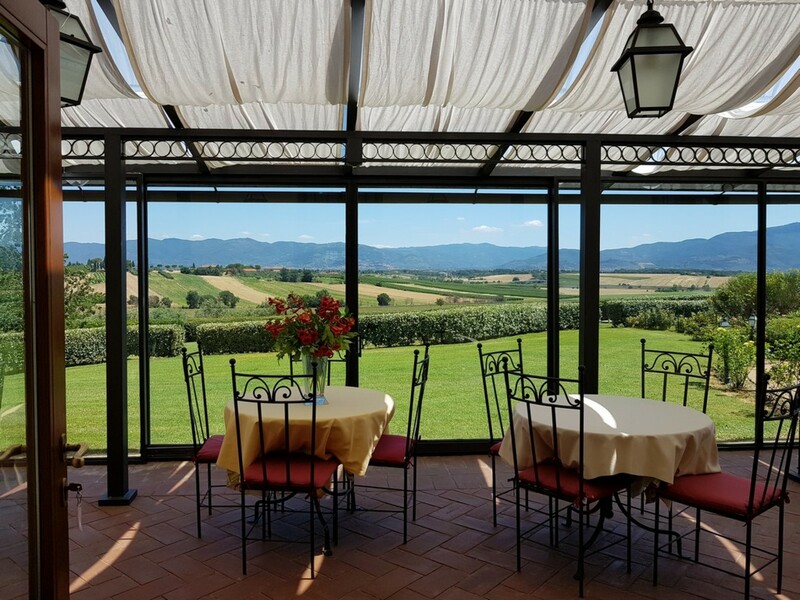 Guests can relax and unwind while enjoying breath-taking views in the shade of the gazebo. 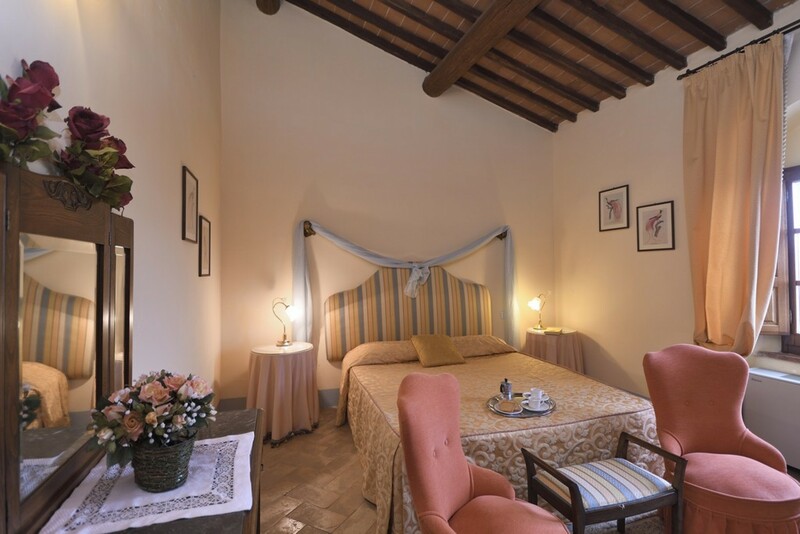 The villa also offers the advantage of a Verandah with sliding glass windows, which enable the use of air-conditioning in the hottest of evenings. 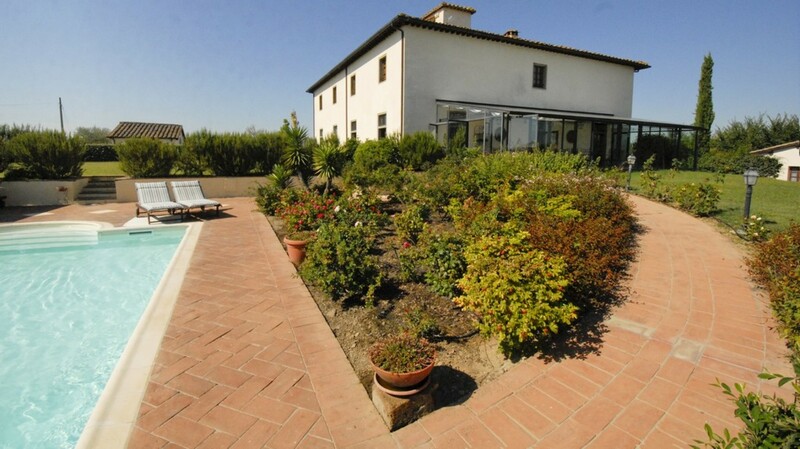 The accommodation is comprised of 800m2. 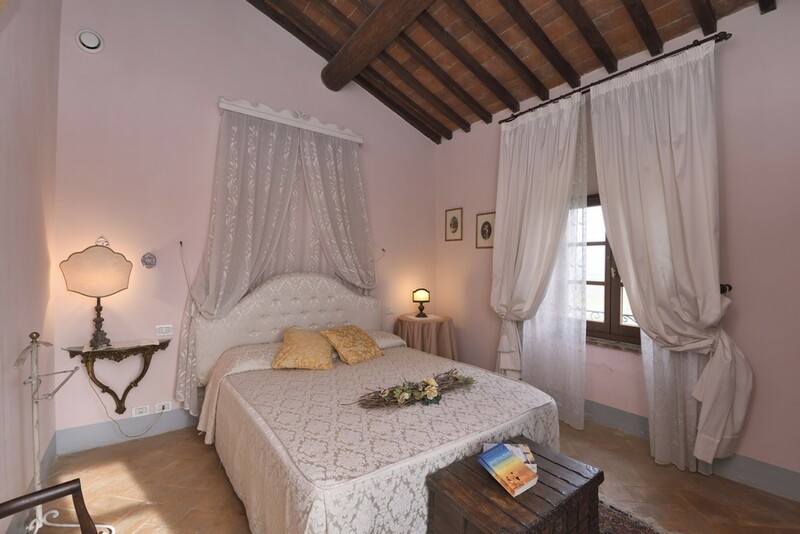 There are 8 bedrooms each decorated with its own unique style. 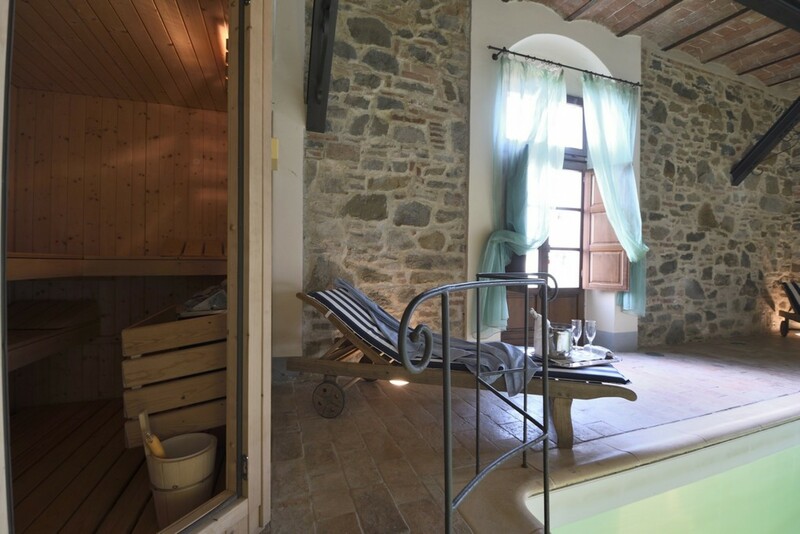 Some of the suites have a sitting room, fireplace and hydromassage bath. 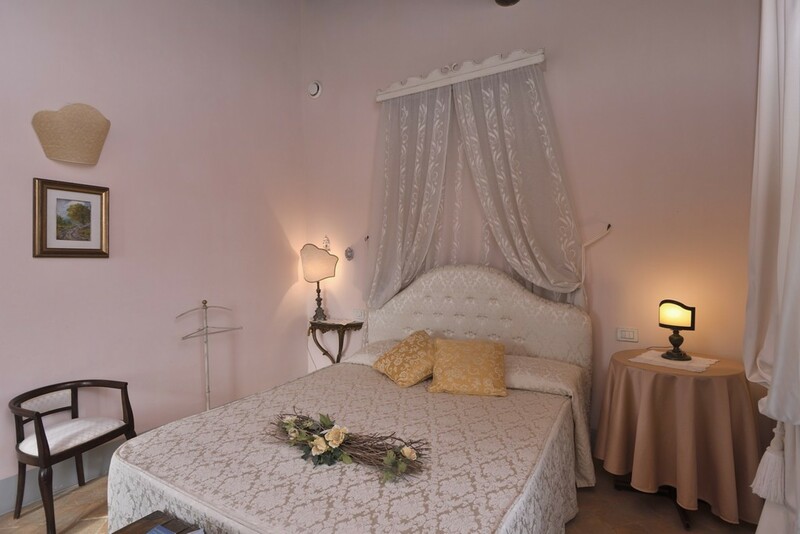 All offer air conditioning satellite TV, frigo bar and internet. 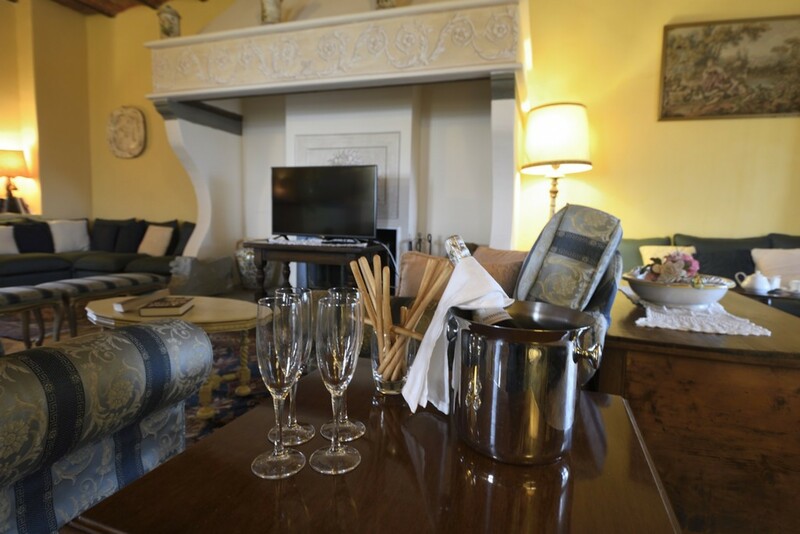 The Ground floor has a lovely entrance and features a lounge with a beautiful fireplace and bar; there is an elegant dining room where guests can enjoy meals together with family and friends. 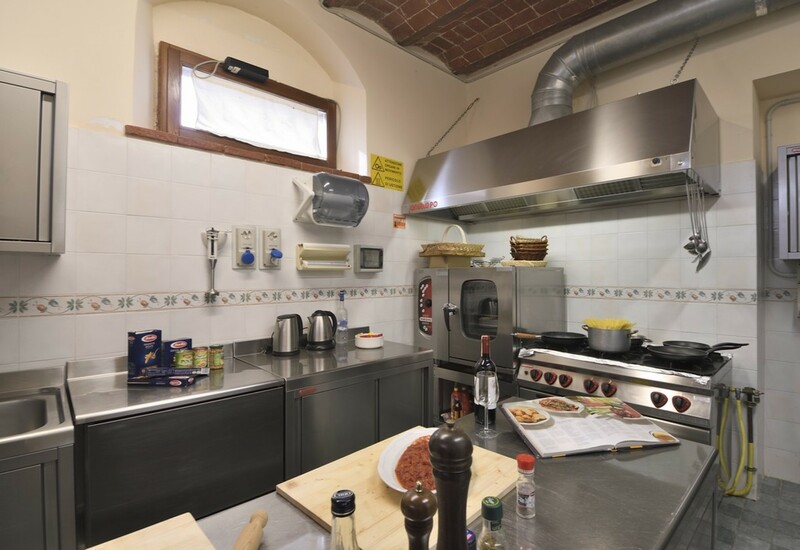 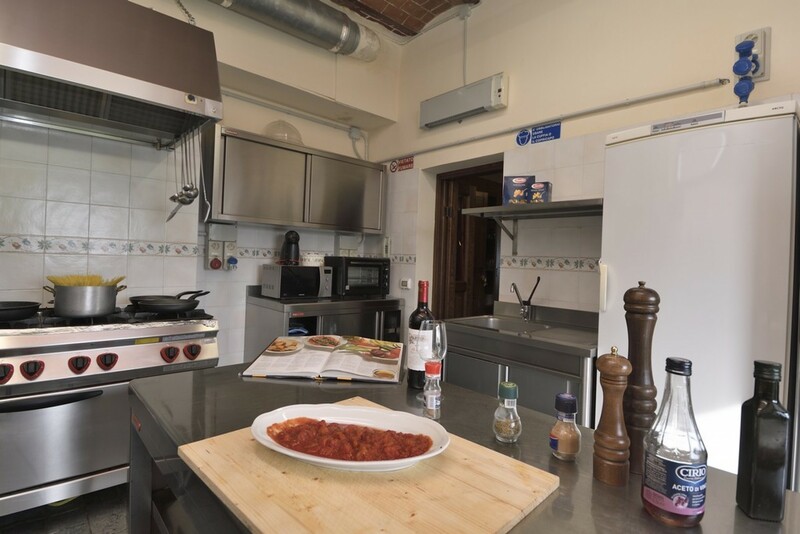 There is a modern professional kitchen which makes for the ideal space for a gourmet chef to prepare you meals. 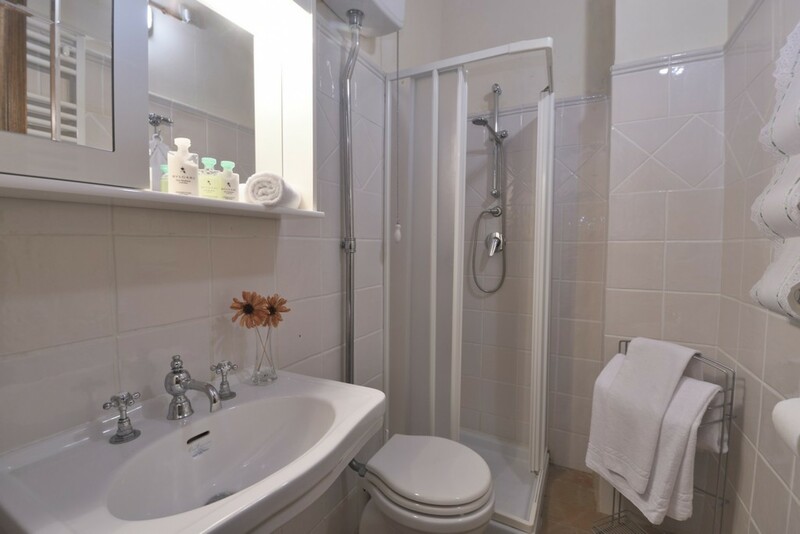 The ground floor features one double bedroom with more modern furnishing with private bathroom and shower. 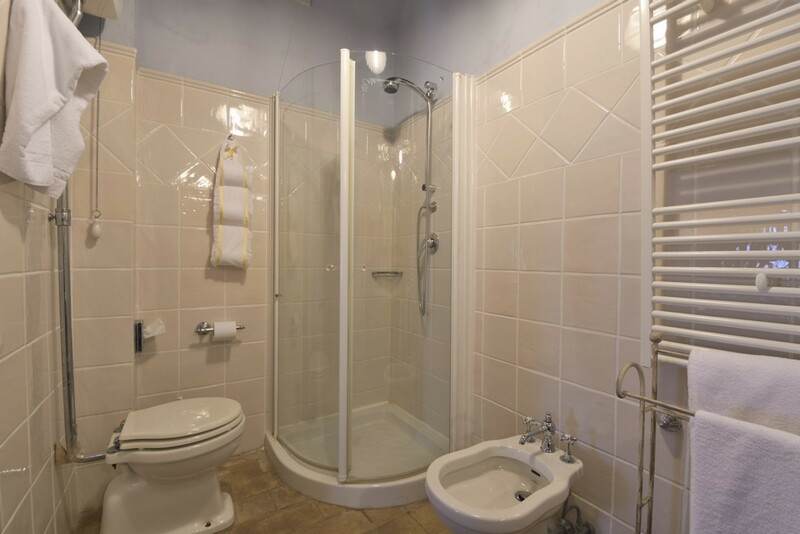 The first floor can be reached by an internal staircase or lift. 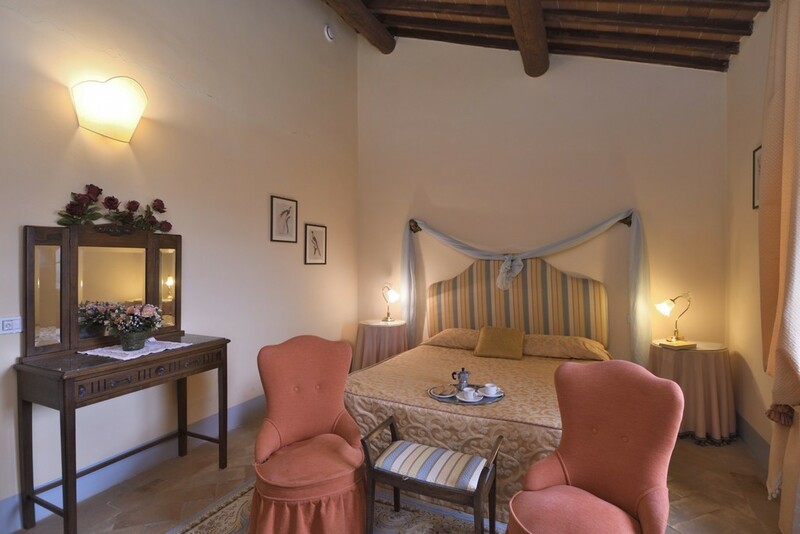 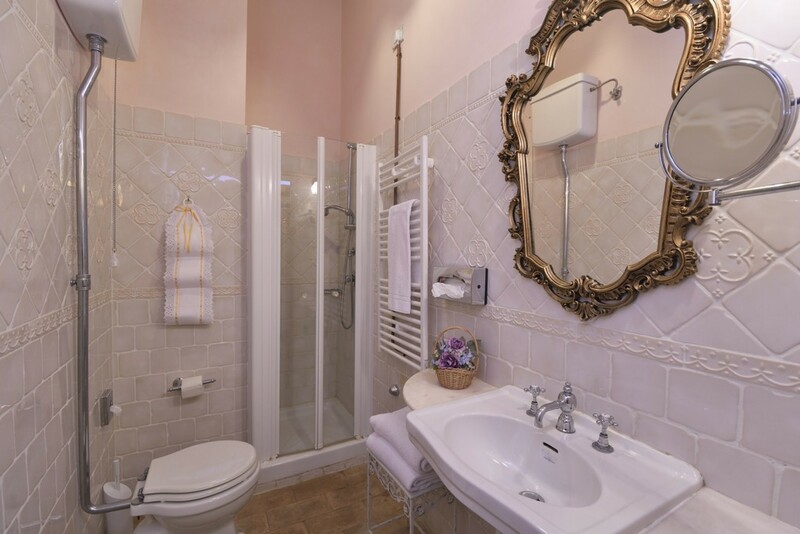 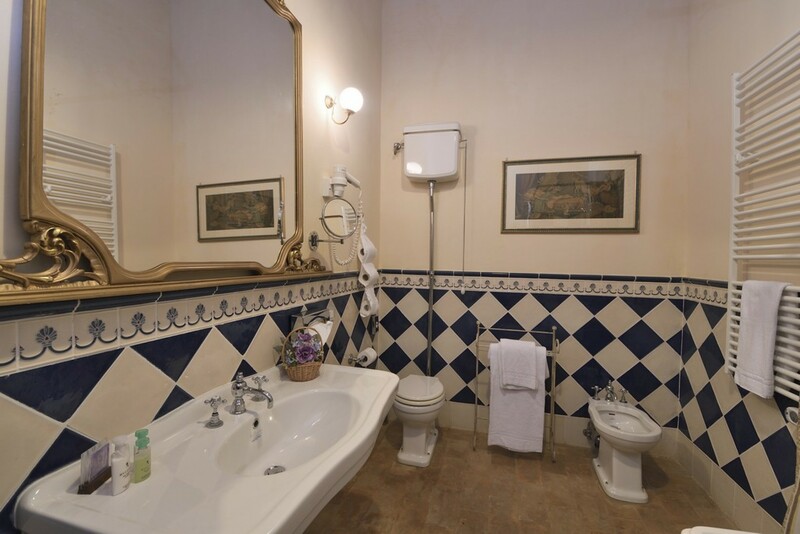 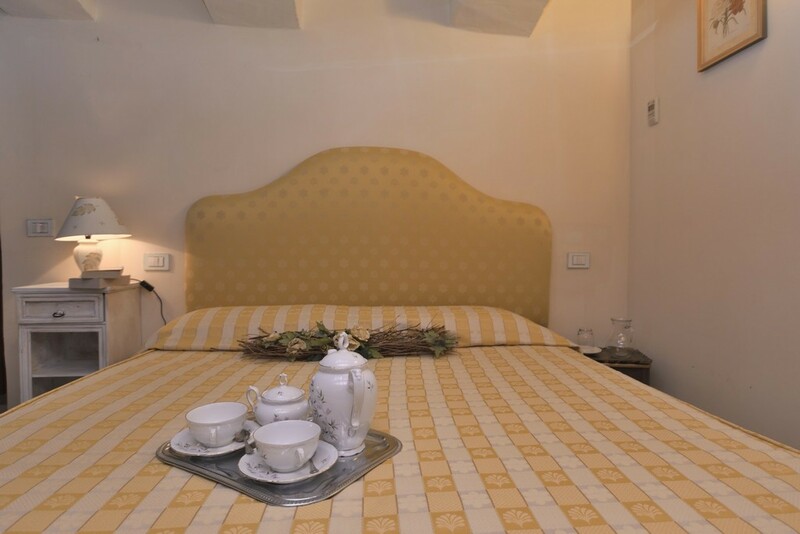 There are two luxury suites comprised of one double bedroom each. 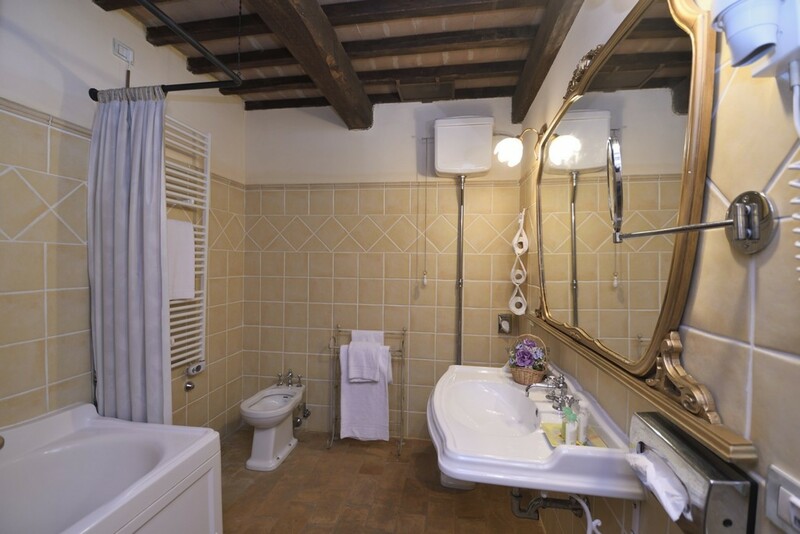 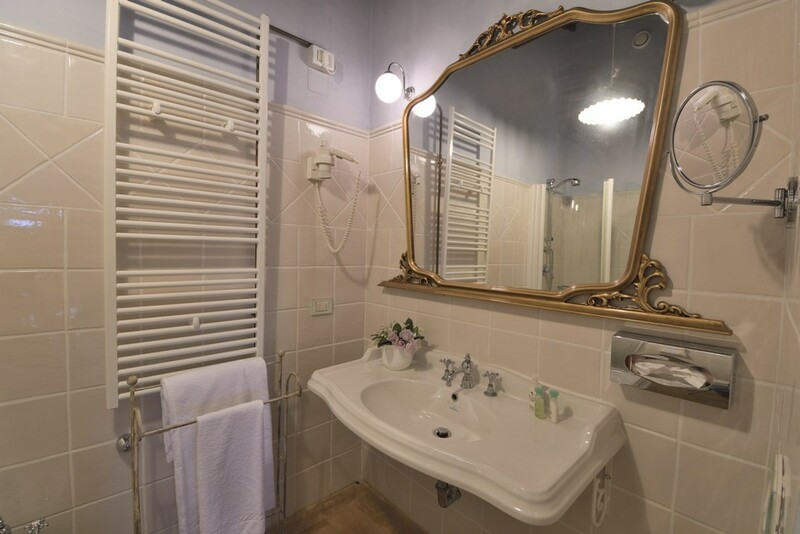 There is a sitting room with fireplace and en-suite bathroom with hydromassage bath. 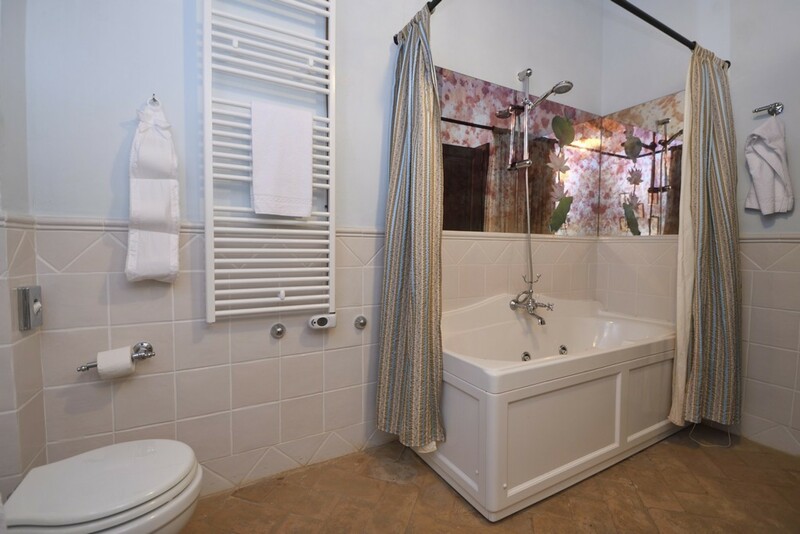 The first floor also features 1 double bedroom with sitting room, fireplace and en-suite bathroom with shower plus there are 4 additional double bedrooms with en-suite bathroom with shower. 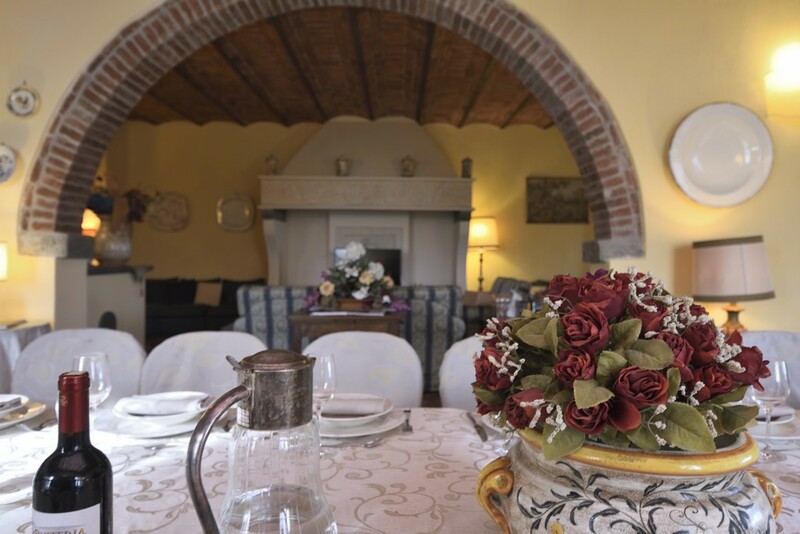 Below is a list of suggested itineraries for guests of the Villa. 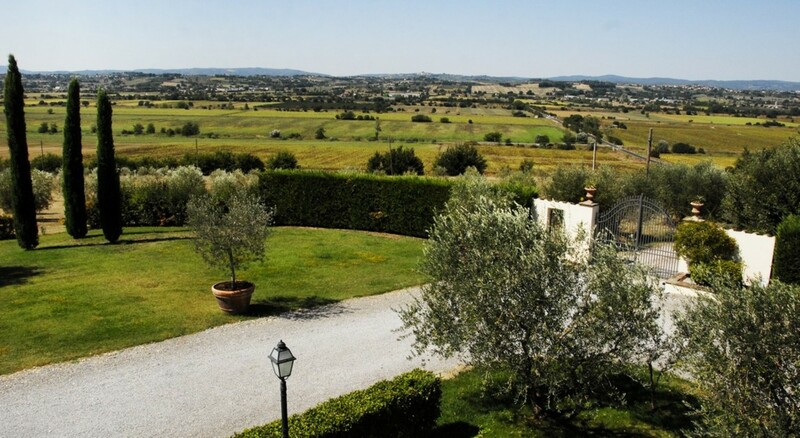 Golf and horse riding can be organized on request in the surrounding area. 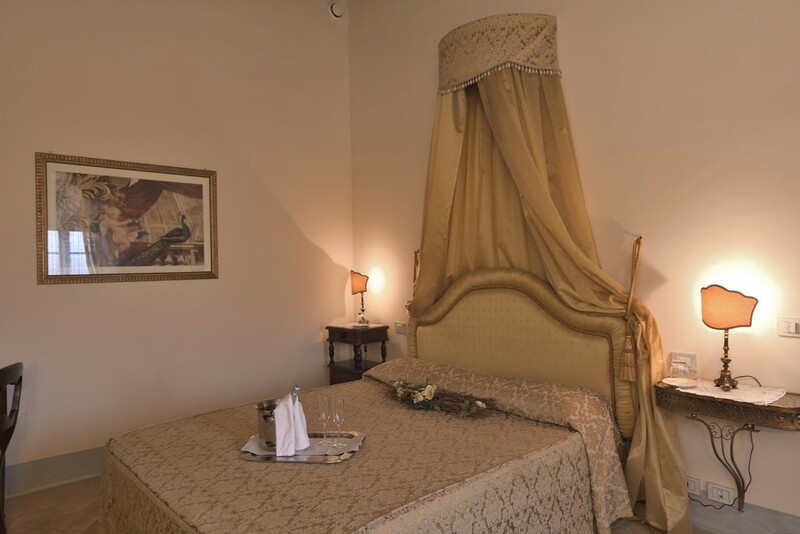 A tour in the heart of Christianity with the visit of some masterpieces immersed in a sacred and spiritual atmosphere. 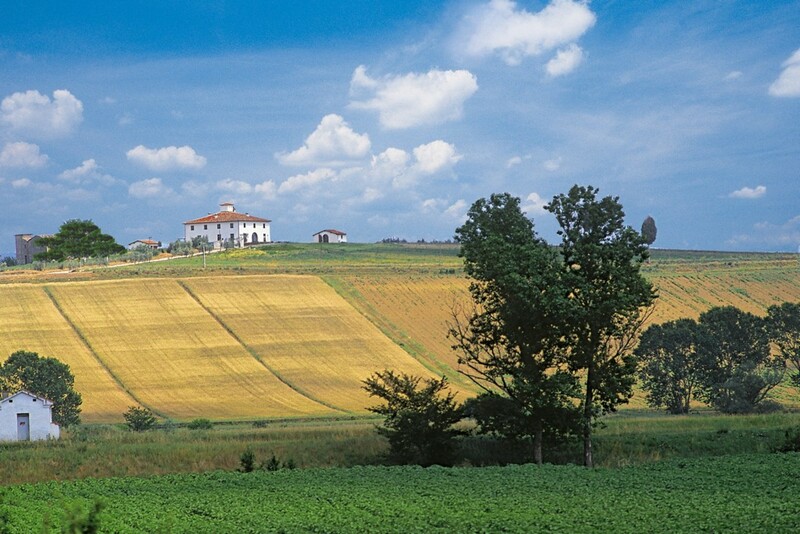 Assisi, Gubbio and La Verna are rich in religious testimonies of St. Francis. 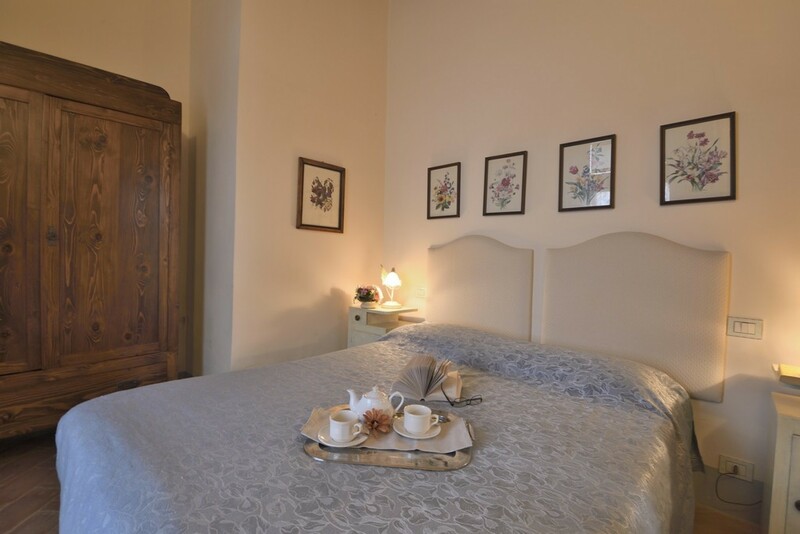 Deruta is famous worldwide for the local production of ceramics. 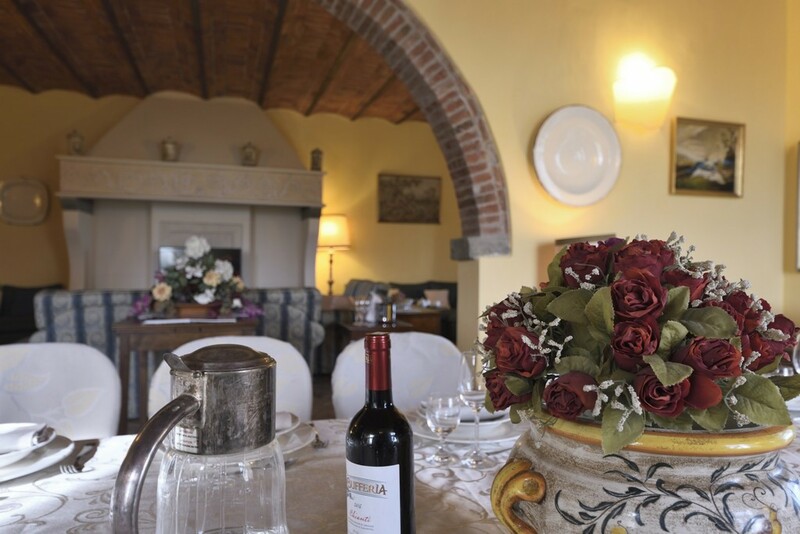 A visit around the Montalcino countryside and its center, where you can visit the fortress and its shops. 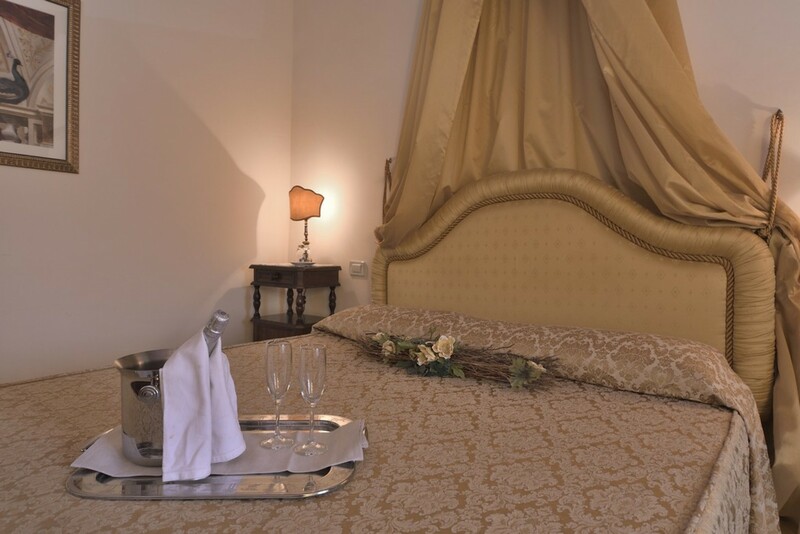 Experience the unique calm of buying the famous Italian brands at incredible prices: Gucci, Armani, Loro Piana, Prada, Malo, Dolce & Gabbana. 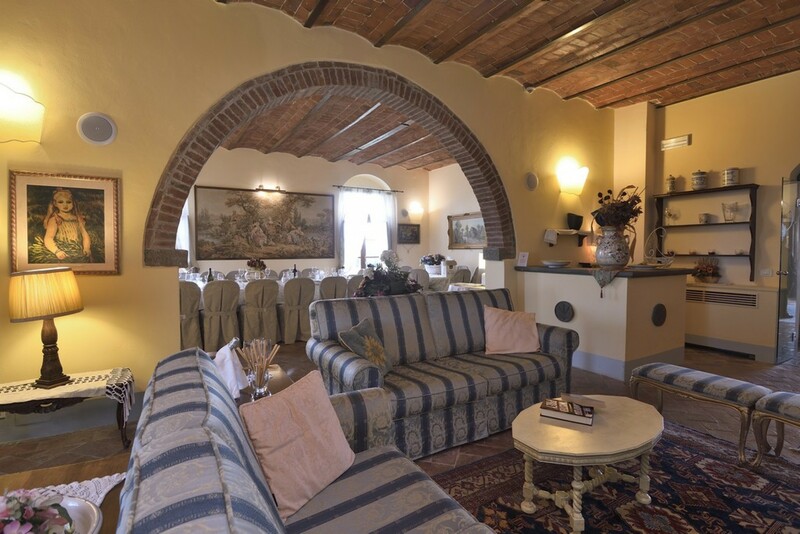 A brief visit to Montepulciano where you can visit the main square and the shops selling typical products. 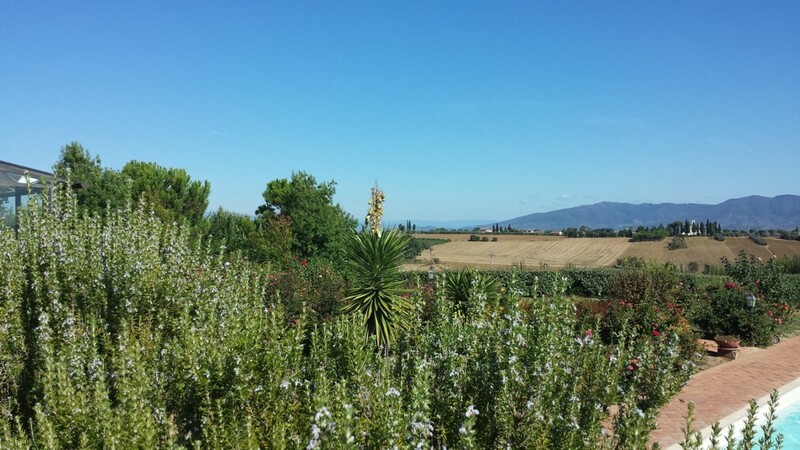 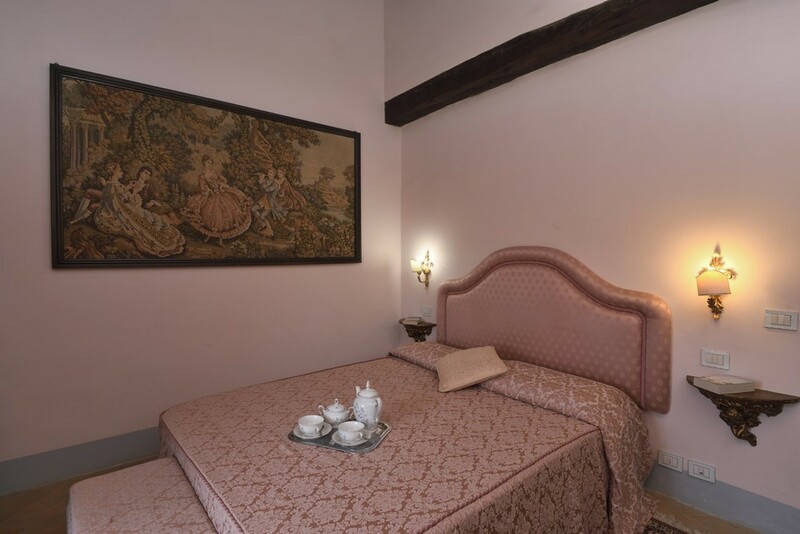 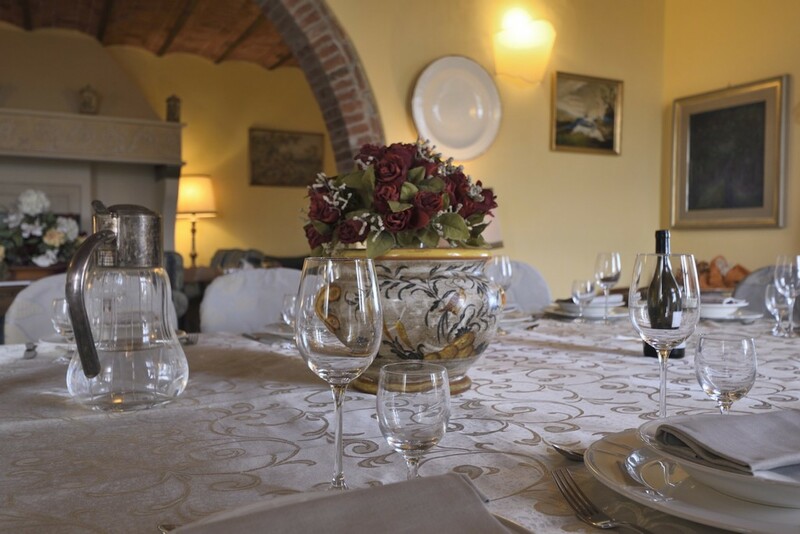 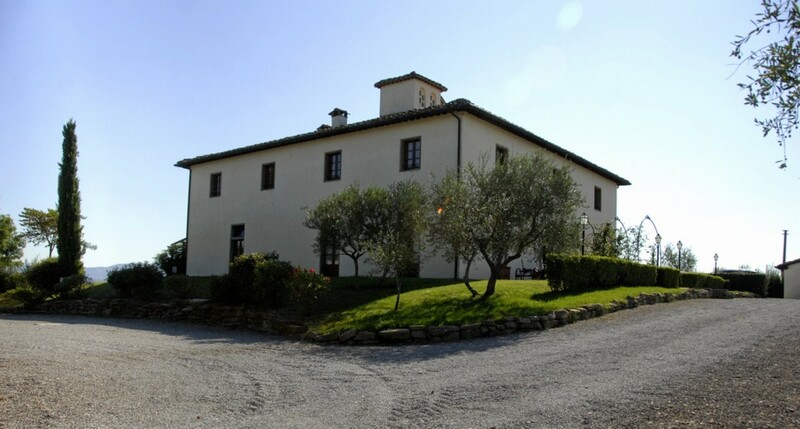 - After 3 km you will arrive at the top of the hill and you will find a sign “agriturismo Belvedere”.